Evaporated milk is a milk product, usually sold in cans, that is made by removing about 60 percent of the water from ordinary milk. Canned evaporated milk can be stored for at least a year, although you should always check the use-by date printed on the can. Also, don't use any cans that are rusted, dented or bulging. Once you open the can, you should store the milk in the refrigerator, preferably not in the original can but in a glass container, and use it within seven days. 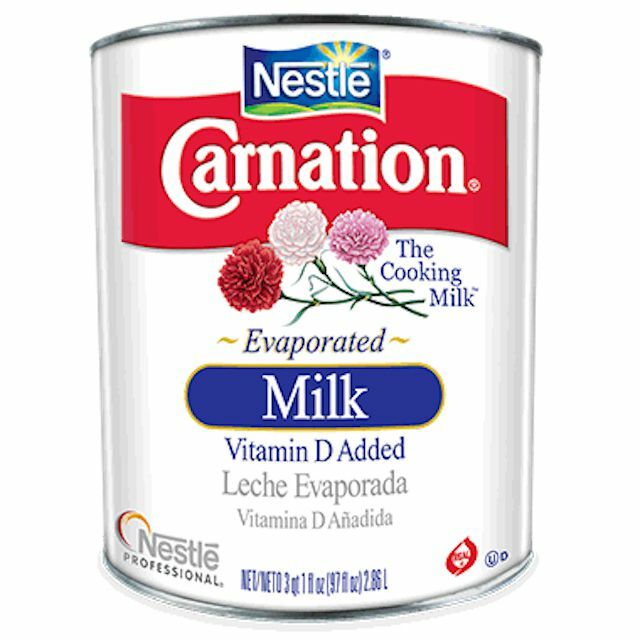 Evaporated milk is enriched with vitamin D. The process of heating the evaporated milk in the cans imparts a slightly sweet flavor to the milk, and it's also just a bit darker in color than ordinary milk. Note that evaporated milk is not the same thing as condensed milk. Condensed milk is also reduced by 60 percent, but it is heavily sweetened and usually used in baking and desserts. Evaporated milk can be used as a substitute for milk or cream, like in coffee and tea or poured over cereal. Evaporated milk can also be used in recipes that call for milk or cream, such as French toast, mashed potatoes or creamed vegetables like this creamed spinach recipe. You can also use evaporated milk in cream sauces like this basic white sauce. You could also use evaporated milk for making the white gravy that accompanies this pork cutlet recipe. Although you can usually use evaporated milk directly from the can in recipes that call for milk, you can convert evaporated milk to back to regular milk simply by diluting it with an equal part of water — so add half a cup of water to half a cup of evaporated milk.